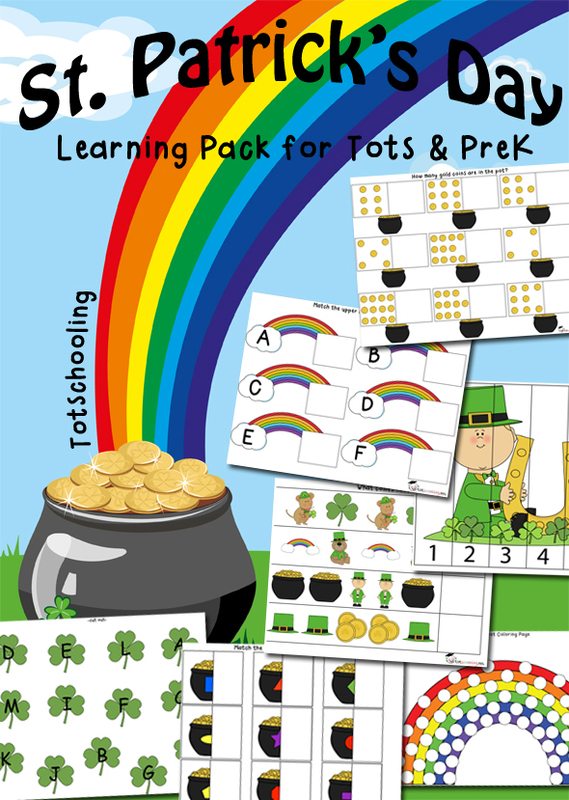 Rainbows, shamrocks and pots of gold coins make for some fun learning activities! You will find plenty of those in this updated St. Patrick's Day pack. This free printable pack is filled with 31 educational activities for toddlers and preschoolers to celebrate the upcoming holiday! This St. Patrick's Day Printable Pack is FREE for all Totschooling subscribers! -You will get access to free printables that are not available for download on the website. This includes holiday and seasonal packs, as well as other themed activity packs. -You will get access to a growing collection of Board Book Printable Activities. -You will receive 1-2 emails per week with new posts, freebies, sales and additions to the site. -You will receive a special subscriber discount for the Online Store. -Your information will never be shared with anybody else. your resources rock! thanks a bunch!